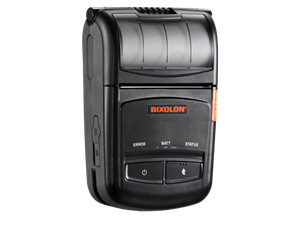 Slim yet rugged, the Bixolon SPP-R210i has a wealth of features to offer the mobile printing market. Water and dust resistant (IP54 with its protective case), the SPP-R210i offers an optional MSR, comes with a long lasting battery life and offers enhanced printing of fonts, graphics and barcode symbologies. The SPP-R210i comes with drivers for Windows, OPOS, JPOS and Linux CUPS and is compatible with both Apple and Android devices. With USB, serial, Bluetooth and WLAN interfaces as standard, the SPP-R210i prints at speeds of up to 90mm per second and features easy paper loading, prints at up to 203dpi on paper widths of up to 58mm and has the ability to print both 1D and 2D barcodes.